The Division of Chifley is an Australian Electoral Division in New South Wales. 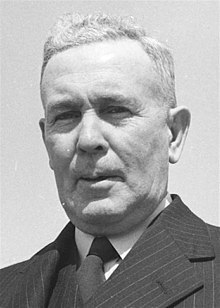 It was created in 1969 and is named for Ben Chifley, who was Prime Minister of Australia 1945–49. It covers some of the outer western suburbs of Sydney including Arndell Park, Bidwill, Blackett, Colebee, Dean Park, Dharruk, Doonside, Emerton, Glendenning, Hassall Grove, Hebersham, Huntingwood, Lethbridge Park, Marayong, Minchinbury, Mount Druitt, Oakhurst, Plumpton, Rooty Hill, Ropes Crossing, Shalvey, Shanes Park, Tregear, Whalan, Willmot, Woodcroft and parts of Eastern Creek, Blacktown, Quakers Hill, Schofields and Riverstone. Ed Husic was the first Muslim elected to the Australian Parliament. ↑ 1.0 1.1 "Profile of the electoral division of Chifley (NSW)". Australian Electoral Commission. 2013. Retrieved 20 August 2013. ↑ Wilson, Lauren (28 September 2010). "New MP is first in Australia to be sworn in with Koran". The Australian. Retrieved 20 August 2013. This page was last changed on 11 April 2018, at 08:55.